I have not been writing much lately. A break after 2+ years of blogging. Yesterday was Malaysia's general election. Hardly any sinkies went to Johor. 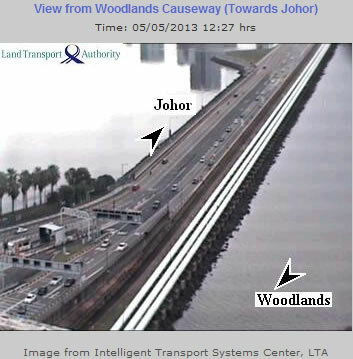 The traffic is very sparse compared to the few couple of vehicles coming into S'pore. Such a situation rarely ever happens on a Sunday. I was hoping Msia's incumbent govt be voted out but alas won with reduced support amid allegations of electoral fraud. Was hoping a change in Msia would spillover to S'pore's general elections 2016. Most people are fearful of change and the ruling party is using fear to their advantage. looks like the same happening here and the next election will not likely to unseat the pap. Thanks for your comment. It is not just fear of the unknown. Taking the example of the Thompson submachine gun, people still fear to adopt it even though it has been proven to be very good. It is only after the mob being fast adopters used the guns to mow down the public that the masses & authority finally wake up. Takes a tragedy to realize the gun's potential. Later in WWII, the Thompson plays a pivotal role in the hands of the allied infantry.